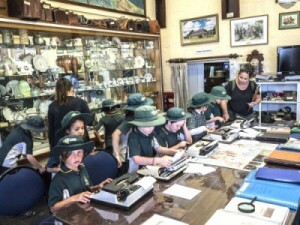 The Busselton Museum welcomes all groups, including Schools, Coaches and Service Groups. School Groups are specially catered for on our Schools open days once a year (dates advised well in advance) as well as individually booked school visits. Many of the old machines will be operated and demonstrations of fading arts such as butter making, milking and spinning are showcased. The children especially enjoy playing “old time” games – tug of war, quoits, in line bowels etc. Remember – with over 5000 items to see make sure your group has plenty of time to browse. This building was originally from the WWII RAAF Busselton Aerodrome, is believed to have first been used as a First Aid Post. It now houses Air Force and WWII memorabilia. The Flood Gate was built in 1929 on the Vasse Estuary at Wonnerup. It is situated on the banks of the picturesque banks of the Vasse River.